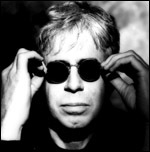 3 May 2000 -- As Bruce Cockburn embarks on another series of tour dates that go right through till August, the Project stops a short while to look back at some of the earlier concerts this year. Susan Kastan reports from New York, Robert Zajac from Chicago. For those that missed the earlier After The Rain reports click here. 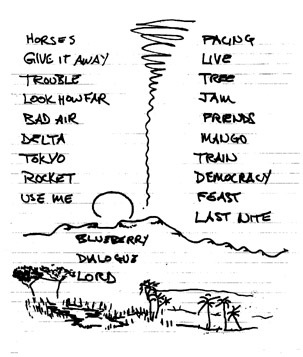 Setlist pictured below courtesy of Christopher Blake, from another March concert at The Royal Oak Theatre, Detroit, Michigan, USA on 4 March 2000. At Town Hall in New York City on 10 March, Bruce Cockburn was introduced by a representative of WFUV, a local college-NPR affiliate station and one of the concert's presenters, as a man "who puts his life into the world, and the world into his music." The musicians took the stage with little fanfare and no words from Cockburn, who smiled softly, then let his electric guitar take command of the room, at first quietly, with the introduction to "You Don't Have to Play the Horses." Steve Lucas began the night playing a six-string bass, deep and rich and bottom heavy in the lovely old hall, yet not overpowering, and Ben Riley's drum kit was enhanced with a rack of copper bells. The stage lighting was a warm orange, as was Cockburn's shirt under a gray jacket, and a faint night-fog floated low, created by lanterns of white light and dry ice. A friend turned me on to Cockburn a year ago via the song "Pacing the Cage," and in listening to recordings I'd paid attention first to the shape of the songs and their poetry, passion and politics. This performance made me feel the musicality that lifts all that into flight. In "The Trouble With Normal" at Town Hall, for example, Cockburn and his guitar took turns speaking, equally eloquently. I found myself diving deeply into the instrumental waves while the words danced on the surface. The range of sounds and styles was astonishing: eerie harmonic overtones on the electric guitar introducing "If I Had a Rocket Launcher"; a high ostinato on the National Resophonic during "Live on My Mind," with its unstable, suspended and blended harmonies pushed almost past tolerance until they resolve in consonance at the line "your eyes looking into mine"; the Latinate speech and jazzy syncopation of a new (as yet untitled) instrumental; modal harmonies on "Dialogue with the Devil." Arrangements were carefully, beautifully layered. "Pacing the Cage," for example, began with the stunningly spare sonority of Cockburn's voice and acoustic guitar alone on the first verse, added a bass filigree for the second, and then, near the end, a soft tambourine provided the only percussion, while the bass played a counter-melody and a downward glissando, like the momentary flash of a match, to highlight the lyric "sometimes the darkness is your friend." Cockburn's give-and-take with bassist Steve Lucas was especially effective, the textures of guitar and bass overlapping at times as Cockburn plucked his own bass line, leaving space for Lucas to supply a propulsive sub-bass or cross over into higher ranges. The two played a duet on the instrumental "Down To The Delta," with Lucas taking a lead line that arched over Cockburn's acoustic guitar, hinting ahead to the bass player's own later superb solo; elsewhere, in "Tokyo," the bass played high chords in a rhythm role from time to time; on "Feast of Fools," Lucas often supplied a deep, single-note pulse to ground Cockburn's rock-guitar riffs and chorus effects. The integrity of Cockburn's writing is striking, as subjects move from the oft-unspoken pleasures of friendship, to the delicious flavors of love, to the export of death in the name of democracy. It seemed almost sacrilegious to tap a foot to the more powerfully political songs, but they too flow from a deep well of feeling, intensify awareness, and encourage, in the best sense, worldly action that, personal or political, stems from compassion and conviction. Thank you, Bruce Cockburn, and amen. 3 March 2000 - Vic Theater, Chicago, Illinois, USA. "Here's an old song, it hasn't been sung in a long time. It seems fitting in this age of neo-Conservatism, which is strikingly similar to neo-Liberalism, which also happens to share frighteningly similar qualities with neo-Fuedalism." With that Bruce broke into an old one from "Further Adventures Of..." called "Feast of Fools". In all the times I've seen this guy play I don't think there was a performance of any song that beat this one. I wish you could have been there. Not only was his voice completely "on" in terms of key and use of descending octave (although there were signs of the recent flu struggle, not that anyone who didn't know would have noticed) but there were some seriously brilliant moments. The solo went very well, there were more than a few harmonic sparks flying around the body of that guitar. After this I couldn't help but yell " Ya still got it!" as loud as I could. This show really ran the gamut as far as the styles that Bruce has parused over the past 16 or so years I've been observing his shows. He played mostly new stuff throughout the evening but mixed in some older stuff too. "The Trouble With Normal" was early in his set selection. It used to be a sing along at the "!IT ALWAYS GETS WORSE!" part. I felt kind of goofy being the only one who remembered to do it. But... I did it anyway... dammit. He pulled out "Tokyo", "Dust And Diesel", "If I Had A Rocket Launcher", "Call it Democracy". These were the songs that really stuck out for me. There was a whole lot more of the stylings from the "Dancing in the Dragon's Jaws"-"Inner City Front" days, but I didn't remember any of the songs that reflected this. Bruce really dove into the jazz chords and changes here. Maybe it's about time I went out and picked up the new record, It's my favorite when he's like that. During the first encore, Mr. Cockburn had a little "Dialogue with the Devil". Again, this was a genius throwback. Many more of those afformentioned harmonic sparks bouncing off an accoustic guitar this time. His very capable support pretty much backed off here (by the way, where to find support like THIS? ), reminding me of the standing room only gig Bruce played at the Vic in Chicago back in 1997. "Night Train" and "When You Give It Away" were the subjects of a light swinging noted by a few fans at the VIC Theater in Chicago. Maybe a little shoulder throwing, neck rocking, you know the rest. Nothing like Cincinatti, 1991? I think? when Bruce had Sam Phillips opening and a solid rock style set. I swear he didn't use more than 4 chords per song the whole night. So other than the fact that the guys who ended up at the table with to me seemed to have a problem with Bruce opening, the evening went very very well. The Vic is a great spot for Bruce, the sound and accoustics are very good and it's a warm, close environment. I hope he comes back through on his way home (nudge nudge). Briefly: I noticed a lot of tell-tale Mobile Recording clues... mmm hmmm. Well now. Thanks Everybody for a great Show (WXRT, JAM, The VIC, and BRUUUUCE! )!